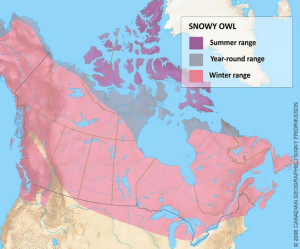 In the winter months, the snowy owl will sometimes migrate south through Canada or Russia, and, and they have been known to reach as far south into the United States as Georgia and Texas in North America, and the southernmost bits of Russia and northern China in Eurasia. Some birds have even been known to travel across the Atlantic to migrate between Russia and Canada. 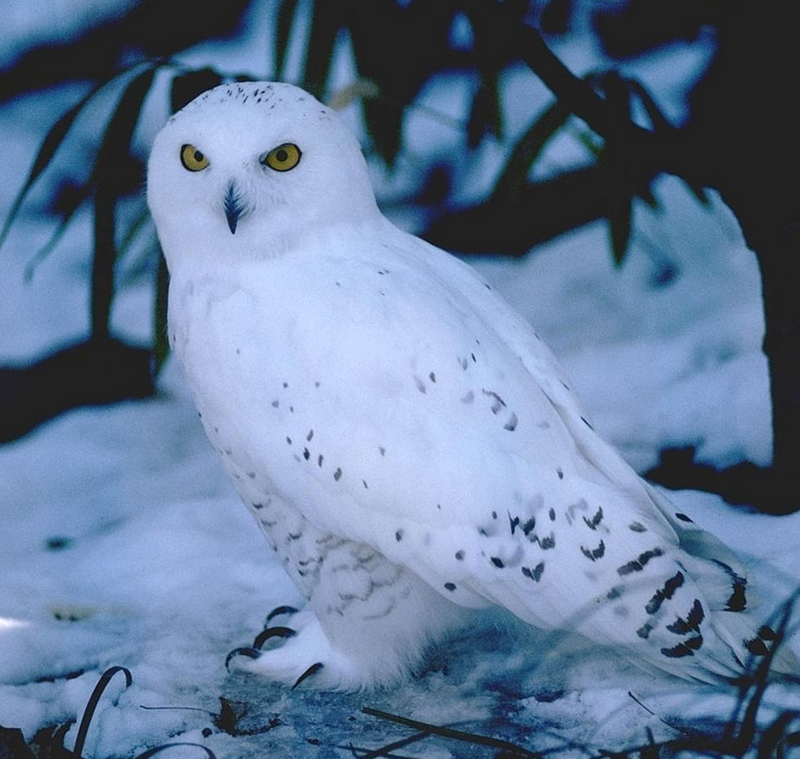 The snowy owl hunts primarily during the day, unlike most other owls, who are nocturnal. (It is believed that this is due to the fact that the Arctic is bathed in almost constant daylight during their breeding period, and they adapted to their environment.) Much of their diet consists of mammals, ranging from smallish rodents to lemmings to hares, and can even include songbirds and geese. If they can get them, adult snowy owls are able to eat up to five lemmings a day. Lemmings are their favourite. When the prey is small-enough, the owls don’t bother breaking it into pieces. Instead, as other carnivorous birds do, they’ll just swallow the prey whole. Within about 18 to 24 hours after eating the prey, the owls will regurgitate a little oval pellet containing the feathers, bones, teeth, fur, and all the other undigestible bits of creature. Snowy owls have few natural predators, but still have a tendency to very feistily protect their nests from foxes, dogs, wolves, and avian predators. They also compete for their favourite food (those delicious lemmings) with many other types of owls, as well as wolves and foxes. Although they do face this competition, the snowy owl is, happily, listed as a Least Concerned species.